The Early Years: Child Well-being and the Role of Public Policy by María Caridad Araujo, Martín Ardanaz, Edna Armendáriz, Jere R. Behrman, Samuel Berlinski, Julian P. Cristia, Yyannu Cruz-Aguayo, Luca Flabbi, Diana Hincapie, Analía Jalmovich, and Sharon Lynn Kagan, Florencia López Bóo, Ana Pérez Expósito, Norbert Schady; edited by Samuel Berlinski & Norbert Schady. Inter-American Development Bank, 2015. Cashing in on Education: Women, Childcare, and Prosperity in Latin America and the Caribbean by Mercedes Mateo Díaz and Lourdes Rodriguez-Chamussy. Latin American Development Forum. World Bank and Inter-American Development Bank, 2016. On Wednesday the Inter-American Development Bank (IADB) launched a new book extolling the benefits of subsidized, public childcare to increase female employment in Latin America. I read the book already sympathetic to its conclusions, but as the external discussant at the book event my main role was to express surprise at the Bank's sudden reversal: as of 2015 The Economist was reporting that the Bank opposed big public daycare programs. The book provides a very clear framing of careful empirical research. And if, like me, you're skeptical of the value of training people how to parent better, the results here might surprise you. The Early Years reached a fairly unambiguous conclusion (see in particular chapter 6): the cognitive benefits to children from home visits are clearly larger and more robust than from daycare. The gains from some of the home visitation programs are almost staggering, exceeding a full standard deviation increase in two cases. Meanwhile, the few rigorous studies of daycare in Latin America showed small (0.2 sd) gains, or in one case, a negative impact on children's cognitive development. Admittedly, some caveats are needed. Five of those nine gray bars, including some of the biggest effects for home visitation programs, all come from quite small studies in Jamaica, with sample sizes ranging from 140 children all the way down to just 39 kids. Similar to recent debates about the US preschool literature, we might worry about basing too much policy on a small number of small sample studies which may have unique characteristics or be context dependent. Beyond the positive Jamaica home visitation studies though, the Ecuador study by Rosero & Oosterbeek (2011) compares daycare and home visits head-to-head, with big effects for the latter (0.55 sd) and negative effects for the former. Overall, this evidence base led The Early Years authors to conclude in 2015 that home visits and pre-school are a better investment than day care. Making a few heroic assumptions about the long-term economic value in the labor market of early childhood cognitive gains, The Early Years estimated that home visits have a benefit-cost ratio in three Latin American countries of around 3, preschool even higher at 3 to 5, and daycare at a significantly lower ratio closer to 1. Governments that seek to improve child development and facilitate the incorporation of women into the labor market may face a difficult trade-off. On the one hand, in the region, parenting and [part-time] preschools have had the greatest impact on child development; however these programs are unlikely to impact female labor supply significantly. On the other hand, [full-time] daycare programs can make it easier for women to work; however, unless they are of high quality [i.e. expensive], daycare programs will not benefit children. And while the authors of The Early Years were acutely aware of the gender issues here—some of the volume's authors also wrote some of the most relevant empirical studies on childcare and female labor force participation in Latin America—the benefit-cost calculations and the policy recommendations focused on children's outcomes, acknowledging but largely setting aside implications for mothers' careers. In Cashing in on Education: Women, Childcare, and Prosperity in Latin America and the Caribbean, Mercedes Mateo Diaz and Lourdes Rodriguez-Chamussy explicitly bemoan the fact that earlier work on childcare in the region has focused only on the gains to children, and ignored the benefits to women. Rather than children’s skills, they focus on the role of childcare in expanding female labor force participation—and hence aggregate economic productivity. Some context is relevant here. Latin America has abysmal female labor force participation rates. Perhaps unsurprisingly in the land of machismo, women often don't work. The numbers Mateo Diaz and Rodriguez-Chamussy present are striking. Adult men in Latin America are almost universally in the labor force. But across Latin America and all its various sub-regions—Andean, Southern Cone, and Central America—only 50-60 percent of women are working or searching for work. While that number has risen in recent years, it's only barely converging at present. 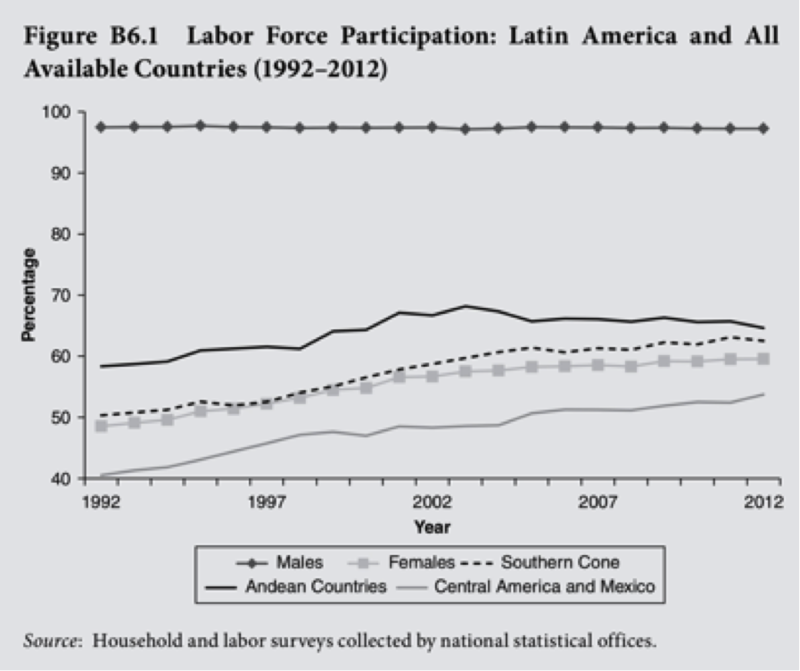 So how much exactly does low female labor force participation cost Latin American economies? There’s no agreed methodology for how to answer this question. Internationally, economists calibrate macro models to account for the misallocation of talent (Hsieh et al 2013), often yielding large implied losses. But these estimates hinge on a long series of complex assumptions. The new IADB volume takes a much more straightforward route, simply calculating foregone income based on the education levels of women out of the labor force. That simply calculation implies losses that range from 3.5 percent of GDP in Mexico to 16.8 percent of GDP in Honduras. More to the point, there is reasonably strong evidence that childcare matters for women’s employment. Mateo Diaz and Rodriguez-Chamussy review the modest but growing number of rigorous studies that have looked at the impact of various forms of daycare and preschool on female labor force participation, with specific focus on Latin America. They find fairly robust, positive impacts of meaningful economic magnitude. At the upper end, effects are quite large: Attanasio and Vera-Hernandez (2004), for instance, find that access to low-cost childcare in Colombia raised the probability of employment from 12 to 37 percent. Large effects on female employment have been documented in Brazil, Mexico, and Ecuador. Interestingly, these effects appear somewhat larger than the modest or null effects found in some studies in the US or Norway, where baseline female labor force participation rates are much higher. Mateo Diaz and Rodriguez-Chamussy note that effects in Chile also appear ambiguous or non-existent, which may reflect greater baseline female employment there as well. Cashing in on Education makes clear that there are often big effects from free daycare on female employment. But are they big enough to justify the costs? It would make for a tidy resolution to this debate (and to this blog post) to say that The Early Years showed home visits are superior when judged solely on the basis of children's cognitive gains, but Cashing in on Education reverses this conclusion by incorporating effects on women as well. That would be a nice teachable moment about the need to go beyond comparative cost effectiveness (focusing on one outcome across several interventions) to a more comprehensive cost-benefit analysis (recognizing multiple outcomes, and using monetary values to add up the benefits from each). Reality is not so tidy. It's not obvious that even the benefits in terms of female labor force participation are large enough to offset the cost of custodial daycare programs. Consider the results from Colombia, which is one of the "best buys" reviewed in Cashing in on Education, with big benefits and relatively low costs. Nevertheless, a quick and dirty calculations suggests a 25 percentage point jump in women working (as cited in the book) multiplied by a monthly income for Colombian women of about $700 in PPP terms (per SEDLAC) fails to overcome the reported program cost per child per month of about $200 in PPP terms (0.25*$700/$200 <1). Even if you add that to the cognitive benefits from daycare in Colombia cited in The Early Years, the results still fails to surpass the benefit-cost ratios for home visits or preschool (see the table above). There may be important benefits that this quick-and-dirty calculation ignores, and that don’t receive much attention in either book. For instance, the employment benefits in my example are static, while just this month a new paper in the American Economic Review documents the long-lasting wage effects of fertility on women's wages. Building in those kinds of dynamic effects could easily tip the scales in favor of child care in a richer cost-benefit analysis. More fundamentally though, gender inequality per se matters, not just as an input into aggregate economic output—something which all the authors of both books would seem eager to sign up for, but isn’t clearly reflected in the conceptual framework of either book. Even as it makes the case for subsidized daycare, Cashing in on Education concedes a lot by framing the gains from childcare and even female labor force participation in terms of GDP, with arguably inconclusive results. An alternative view—articulated at last week’s even by the World Bank’s deputy chief economist, Ana Ravenga—is that free, universal access to public childcare promotes both equality and a norm about gender roles that we may value intrinsically. Perhaps that can be the focus of the third IADB volume on the topic. Dos libros recientes revelan un debate interno sobre el valor de la guardería para niños y de la mano de obra femenina en el Banco Interamericano de Desarrollo. Las evaluaciones de impacto muestran que los programas de visitas domiciliarias son menos costosas y mejores en comparación a las guarderías. Sin embargo, un nuevo volumen argumenta que el análisis costo-beneficio puede cambiar si también se toma en cuenta el impacto sobre las mujeres. Los Primeros Aaños: El bienestar del niñoinfantil y el papel de las políticas públicas por María Caridad Araújo, Martín Ardánaz, Edna Armendáriz, Jere R. Behrman, Samuel Berlinski, Julián P. Cristia, Yyannu Cruz- Aguayo, Luca Flabbi, Diana Hincapie, Jalmovich, y Sharon Lynn Kagan, Florencia López Bóo, Ana Pérez Expósito, Norbert Schady; Editado por Samuel Berlinski y Norbert Schady. Banco Interamericano de Desarrollo, 2015. Aprovechando la Educación: Mujeres, Cuidado Infantil y Prosperidad en América Latina y el Caribe por Mercedes Mateo Díaz y Lourdes Rodriguez-Chamussy. Foro Latinoamericano de Desarrollo. Banco Mundial y Banco Interamericano de Desarrollo, 2016. El miércoles, el Banco Interamericano de Desarrollo (BID) lanzó un nuevo libro elogiando los beneficios del uso de guarderías subsidiadas y públicas para aumentar el empleo femenino en América Latina. Ya simpatizando con las conclusiones, leí el libro, pero en mi rol de comentarista externo en el lanzamiento del libro, mi rol principal fue el de expresar mi sorpresa por la súbita reversión del banco: a partir del 2015, The Economist ya estaba reportando que el banco se opuso a grandes programas de guardería pública. El libro proporciona un marco muy claro de investigación empírica cuidadosa. Y si, como yo, eres escéptico respecto del valor de entrenar a la gente sobre cómo educar mejor, los resultados aquí te sorprenderán. Los Primeros Años llegó a una conclusión bastante clara (vea capítulo 6): los beneficios cognitivos para los niños a partir de las visitas domiciliarias son claramente más grandes y más robustos que los de la guardería. Las ganancias de algunos de los programas de visitas domiciliarias son casi desconcertantes, superando un aumento total de una desviación estándar en dos casos. Mientras tanto, la poca cantidad de estudios rigurosos sobre las guarderías en América Latina mostraron ganancias pequeñas (0.2 sd), o en un caso, un impacto negativo en el desarrollo cognitivo de los niños. Por supuesto, se necesitan algunas salvedades. Cinco de esas nueve barras grises, incluyendo algunos de los efectos más grandes para los programas de visitas domiciliarias, provienen de estudios bastante pequeños en Jamaica, con tamaños de muestra que van desde 140 niños hasta sólo 39 niños. De manera similar a los recientes debates sobre la literatura sobre la educación preescolar en EE.UU., nos podría preocupar el basar políticas en un número pequeño de estudios con muestras pequeñas que podrían tener características únicas o podrían depender del contexto. Sin embargo, más allá de los estudios positivos de visitas domiciliarias en Jamaica, el estudio de Rosero y Oosterbeek (2011) compara la guardería y las visitas domiciliarias, mostrando efectos grandes para esta última (0.55 sd) y efectos negativos para la primera. En general, esta evidencia llevó a los autores de Los Primeros Años concluir en 2015 que las visitas domiciliarias y la educación preescolar son una mejor inversión que las guarderías. Haciendo algunos supuestos heroicos sobre el valor económico de largo plazo en el mercado de trabajo de las ganancias cognitivas de la primera infancia, Los Primeros Años estimó que las visitas domiciliarias tienen un ratio beneficio-costo en tres países latinoamericanos de alrededor de 3 la educación preescolar aún mayor de 3 a 5, y la guardería un ratio significativamente menor cercano a 1. Los gobiernos que pretenden mejorar el desarrollo infantil y posibilitar la incorporación de las mujeres en el mercado laboral se enfrentan a una disyuntiva difícil. Por un lado, el mayor impacto en el capital humano de los niños de la región lo tienen programas como los de visitas domiciliarias y de educación preescolar [a tiempo parcial], los cuales es poco probable que influyan en la oferta laboral femenina de manera significativa. Por otro lado, los servicios de jardines de cuidado infantil [a tiempo completo] pueden facilitar el trabajo de las mujeres, pero salvo que sean de buena calidad [i.e. de precio alto], no beneficiarán a los niños. Y mientras que los autores de Los Primeros Años estaban conscientes de los problemas de género --algunos de los autores del volumen también escribieron algunos de los estudios empíricos más relevantes sobre el cuidado de los niños y la participación de las mujeres en la fuerza de trabajo en América Latina--los cálculos costo-beneficio y las recomendaciones de política se centraron en los resultados sobre los niños, reconociendo pero en gran medida dejando de lado las implicaciones para las carreras de las madres. En Aprovechando la Educación: Mujeres, Cuidado Infantil y Prosperidad en América Latina y el Caribe, Mercedes Mateo Díaz y Lourdes Rodríguez-Chamussy se lamentan explícitamente del hecho de que los trabajos anteriores sobre el cuidado de los niños en la región se han centrado únicamente en las ganancias para los niños y han ignorado los beneficios para las mujeres. En lugar de las habilidades de los niños, se centran en el papel del cuidado de los niños en la expansión de la participación de la fuerza laboral femenina y, por lo tanto, de la productividad económica agregada. Algo de contexto es relevante aquí. América Latina tiene tasas abismales de participación de la fuerza laboral femenina. Tal vez sin sorpresa en la tierra del machismo, las mujeres a menudo no trabajan. Los números que Mateo Díaz y Rodríguez-Chamussy presentan son sorprendentes. Los hombres adultos en América Latina están casi universalmente en la fuerza laboral. Pero a través de América Latina y de todas sus diversas subregiones--los países andinos, el Cono Sur y Centroamérica--sólo el 50-60 por ciento de mujeres están trabajando o buscando trabajo. Si bien este número ha aumentado en los últimos años, apenas ha convergido. Entonces, ¿cuánto cuesta exactamente la baja participación femenina en la fuerza laboral en las economías latinoamericanas? No hay una metodología establecida para responder esta pregunta. A nivel internacional, los economistas calibran modelos macro para explicar la mala asignación de talento (Hsieh et al., 2013), produciendo a menudo grandes pérdidas implícitas. Pero estas estimaciones dependen de una larga serie de supuestos complicados. El nuevo volumen del BID toma una ruta mucho más sencilla, calculando simplemente el ingreso no percibido basado en los niveles de educación de las mujeres fuera de la fuerza de trabajo. Ese cálculo simple implica pérdidas que van desde 3.5 por ciento del PIB en México hasta 16-8 por ciento del PIB en Honduras. Más al punto, existe evidencia razonablemente sólida que el uso de guarderías importa para el empleo de las mujeres. Mateo Díaz y Rodríguez-Chamussy revisan el modesto pero creciente número de estudios rigurosos que han examinado el impacto de las diversas formas de guardería y de educación preescolar en la participación femenina en la fuerza de trabajo, con especial atención a América Latina. Encuentran impactos positivos, robustos y de magnitud económica significativa. En el extremo superior, los efectos son bastante grandes: Attanasio y Vera-Hernández (2004), por ejemplo, encuentran que el acceso a guarderías de bajo costo en Colombia aumentó la probabilidad de empleo de 12 a 37 por ciento. Se han documentado efectos grandes en el empleo femenino en Brasil, México y Ecuador. Curiosamente, estos efectos parecen algo mayores que los efectos modestos o nulos encontrados en algunos estudios en los EE.UU. o en Noruega, donde las tasas de participación femenina en la fuerza de trabajo son mucho más altas. Mateo Díaz y Rodríguez-Chamussy señalan que los efectos en Chile también parecen ambiguos o inexistentes, lo que puede reflejar una línea de base mayor para el empleo femenino de base allí también. Aprovechando la educación deja claro que a menudo hay efectos grandes de la guardería gratuita sobre el empleo femenino. ¿Pero son lo suficientemente grandes como para justificar los costos? Este debate (y este blog post) podría concluirse elegantemente reconociendo que Los Primeros Años mostró que las visitas domiciliarias son superiores cuando se juzgan únicamente sobre la base de las ganancias cognitivas de los niños, pero Aprovechando la Educación revierte esta conclusión mediante la inclusión de efectos sobre las mujeres. Sería un buen momento para enseñar acerca de la necesidad transitar de un análisis comparativo de costo-efectividad (centrándose en un resultado a través de varias intervenciones) hacia un análisis de costo-beneficio más exhaustivo (reconociendo resultados múltiples y utilizando valores monetarios para sumar los beneficios de cada uno). La realidad no es tan ordenada. No es obvio que incluso los beneficios en términos de participación femenina en la fuerza de trabajo sean lo suficientemente grandes como para compensar el costo de los programas de guardería infantil. Considere los resultados de Colombia, que es uno de los "mejores casos" revisados en Aprovechando la Educación, con grandes beneficios y costos relativamente bajos. Sin embargo, unos cálculos rápidos sugieren que un salto de 25 puntos porcentuales en las mujeres que trabajan (como se menciona en el libro) multiplicado por un ingreso mensual para las mujeres colombianas de unos 700 dólares en términos PPC (por SEDLAC) no logra superar el costo del programa reportado por niño y por mes de aproximadamente $ 200 en términos PPC (0.25 * $700 / $200 < 1). Incluso si se suma a los beneficios cognitivos de la guardería en Colombia citados en Los Primeros Años, los resultados aún no superan los ratios costo-beneficio de las visitas domiciliarias o de la educación preescolar (véase la tabla anterior). Puede haber importantes beneficios que este cálculo rápido ignora, y que no reciben mucha atención en ninguno de los libros. Por ejemplo, los beneficios del empleo en mi ejemplo son estáticos, mientras que, en este mes, un nuevo artículo en el American Economic Review documenta los efectos de largo plazo de la fecundidad en los salarios de las mujeres. La construcción de ese tipo de efectos dinámicos podría fácilmente inclinar la balanza a favor de las guarderías en un análisis costo-beneficio más elaborado. Más fundamentalmente, sin embargo, la desigualdad de género es importante en sí mismas, no sólo como un aporte a la producción agregada--algo que todos los autores de ambos libros parecen deseosos de avalar, pero que no se refleja claramente en el marco conceptual de ninguno de los libros. Aun cuando Aprovechando la Educación hace el caso a favor de guarderías subsidiadas, el libro concede mucho al enmarcar las ganancias de las guarderías e incluso la participación de la fuerza laboral femenina en términos del PIB, con resultados no concluyentes. Una visión alternativa--articulada incluso en la semana pasada por Ana Ravenga, economista jefe adjunta del Banco Mundial--es que el acceso universal y gratuito al cuidado infantil público promueve la igualdad y una norma sobre los roles de género que valoraríamos intrínsecamente. Tal vez eso pueda ser el foco del tercer volumen del BID sobre el tema.